Archeological remains that were found during an excavation in Urridakot in Gardabaer, a neighboring town of Reykjavík, were much older than archeologists had assumed. They date back to the settlement of Iceland in the 9th century AD while Urridakot is first mentioned in written sources from the 16th century. Hólar, a different archeological site. Photo by Geir Ólafsson. Excavation has been ongoing in Urridakot in the past years because of planned construction in the area. In 2006 the local authorities asked the Institute of Archaeology to fully complete the registration of archeological remains within the town limits, Fréttabladid reports. “The first test dig was made in Urridakot in 2007 and last year the excavation was to be completed at which point I decided to dig in the area between those that had been tested,” said archeologist Ragnheidur Traustadóttir. “Nothing could be seen on the surface and there are no sources on anything in the area but then we discovered a magnificent cowshed from the Settlement Era,” she described, adding that they also found a lodge, storage room, pantry and a cooking hole from the 9th to 11th century; further research is required to determine how old the remains are exactly. Remains dating back to the Middle Ages, shortly after 1226, have also been found: a pantry, kitchen and outhouse. No living quarters from that time have been found yet but they may have been located above the excavation area. Conditions for preservation are poor at Urridakot so biological remains haven’t been found. Few but notable objects have been discovered such as two spindles, one of which is decorated and the other inscribed with runes, which is rare in Iceland. Two pearls from the Viking Age have also been found, along with baking plates, a sharpener imported from Norway, knives made of iron, nails and various bronze sheets. Traustadóttir said there are many indications that there was seasonal habitation at Urridakot but not permanent; no such dwelling, known as sel in Icelandic, has been thoroughly researched. The remains found at Urridakot will be displayed in the future although probably not at that exact location. 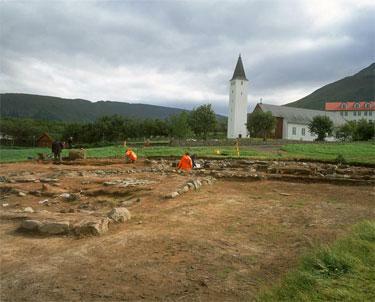 They might be exhibited in connection with Hofsstadir, the local archeological center.